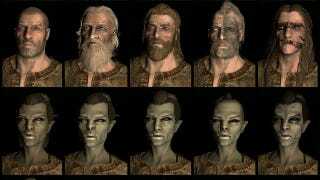 What Race Will You Play in Skyrim? It's something I debated for weeks, and even after making the decision for the first time playing the game, I was already ready to second-guess myself and try something different on PC. There are a ton of different races to play in the game, and the stat bonuses that each one allows shouldn't go overlooked. They feel more consequential than in Oblivion, and after you choose, you can't go back! Anyhow, for our week-ending open thread, I thought I'd throw the question out to you. What race are you playing in Skyrim? Is the northern setting making you consider playing as a Nord? Would your normal preference of Kajit just feel too out-of-place? Damn it all, reading this list of character attributes, I almost want to go re-roll yet again and be a Redguard. Will the second-guessing ever end?